WEATHERFORD, Texas – There’s a lot of cowboy among the 910 square miles that make up Parker County. It’s about to get a little more Western with the Parker County Frontier Days and PRCA Rodeo, set for 8 p.m. Wednesday, June 12-Saturday, June 15, at the Parker County Sheriff’s Posse Arena. This is Cowboy Country, and hundreds of the top athletes in rodeo will converge on Weatherford for the four-day event. 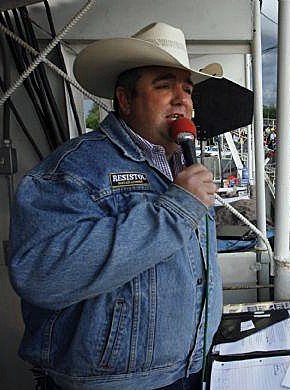 Andy Stewart is the announcer at the Parker County Sheriff’s Posse Frontier Days and PRCA Rodeo and has held that title for eight years. He’s had a front-row seat for all the great action in Weatherford, Texas. There are 552 contestants who are scheduled to compete representing dozens of ProRodeo world championships and hundreds of Wrangler National Finals Rodeo qualifications. These are the elite cowboys and cowgirls in the sport, and they’ll be matched with the award-winning livestock of Pete Carr’s Classic Pro Rodeo and Carr Pro Rodeo, the producers of the annual event. The Carr crew will do that. The two firms are established and have been recognized for years as the elite among livestock producers. This spring, Carr made put everything together by purchasing Classic. In 2013, the firms will produce 34 rodeos in 13 states and have some of the greatest animal athletes in the sport. That’s a big reason so many top names plan to make their way to Parker County in mid-June. Sundell has done awfully well on Carr animals this year. He won the rodeo in Claremore, Okla., by matching moves with Carr Pro Rodeo’s Social Call for 83 points over Memorial Day weekend. In early May, he placed second in Guymon, Okla., after an 85 on Carr Pro Rodeo Miss Congeniality; still, his biggest win of the season came when he won the $50,000 round at RodeoHouston on Pete Carr’s Classic’s Big Tex after a 90-point ride. But the animal is just half the equation; it takes a solid performance by the man on the beast to make for a winning score. That’s what fans will experience in Weatherford.